Professor Sir Ralph Turner MC. Other units in which Gurkha soldiers served after 1815 and also the units of the Royal Nepalese Army which, as Britain's allies, took part in the Indian Mutiny and the First and Second World Wars. Unveiled by Her Majesty Queen Elizabeth II on 3rd December 1997. Unveiled by the Queen. Modelled by Jackson on the 1929 statue by Goulden in the Foreign Office. 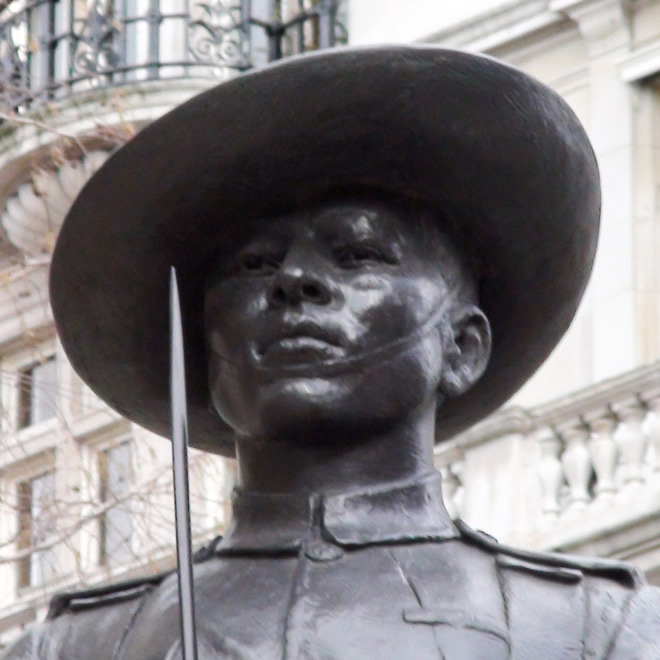 The first regiment of Gurkha soldiers was formed in 1815. The bi-centenary was commemorated in 2015 at this statue and "new plaques honouring those who have taken part in recent operations" were supposedly added but when we visited after the event we couldn't find them. Died: 649 Argentinians, 255 British, 3 civilian Falkland Islanders.